Microwaves use the energy of high-frequency radio waves to heat food by making water molecules in the food vibrate. There are three reasons microwave ovens save so much energy. First, they dramatically reduce cooking time, second, the unit itself uses less energy to cook the food than other appliances like a cooktop or oven would require. And third, they heat only the food, not the oven and the surroundings. Cooking with a microwave is estimated to use only one-third as much energy as other alternatives. And during the summer, you also save on air conditioning bills by not generating unnecessary heat in the kitchen. 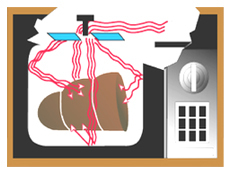 Microwave ovens come in a wide array of sizes and power levels. Some include features of a conventional oven like ability to broil and use convection cooking.